When a tooth is fractured, has a large old filling or is damaged by decay, we might recommend a crown (cap) to strengthen and protect the remaining tooth structure. There are different kinds of crowns: full porcelain, porcelain fused to metal or all metal. Fitting a crown requires atleast two visits to the dentist. You may have lost a tooth leaving an empty space in that area. When one or more teeth are missing, the remaining teeth may drift out of position leading to change in bite, gum problems, decay or loss of additional teeth. There are multiple options of replacing a missing tooth. But bridge is one of them. A bridge is a fixed appliance that replaces missing teeth. There are different types of bridges. Porcelain is the most chosen material because it is very esthetic and strong for bridges. Whether you require a crown or a bridge the process involves mostly 2 appointments. At the first appointment, the dentist will numb your tooth and obtain an impression of your existing teeth for a temporary crown or bridge. Next, they will spend time shaping and preparing your teeth for the restoration. Subsequent to that, they will obtain a detailed and accurate impression of your teeth. This impression will be sent to the laboratory so that they can fabricate a high quality strong and esthetic restoration for you. The dentist will also obtain an accurate shade of your teeth. Your participation is very crucial during this step. Before you leave, the assistant will place a temporary restoration on your teeth. It will either be a tooth colored temporary crown or a temporary bridge depending upon which procedure is being done. 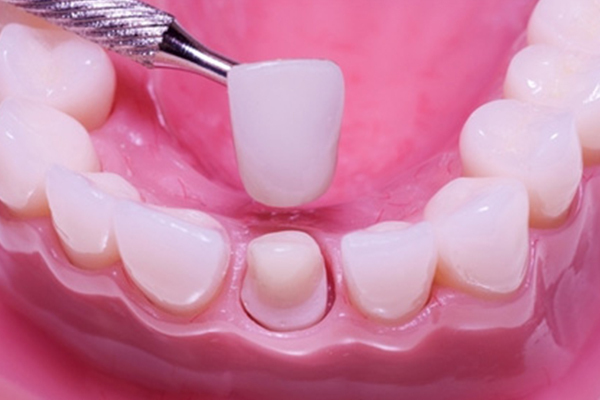 At the second visit, your permanent crown or bridge is delivered after careful evaluation of margins, contacts and your bite. It is very important for you to communicate with your dentist at this stage and honestly evaluate the shade, bite and contour of your restoration. It might take few days for you to get used to your new crown or bridge, but any concerns or questions may be addressed to the doctor. Also, it is very crucial for you to learn to keep these restorations clean and hygenic.